For over a year now I have been on the way to recovery from an eating disorder and depression! One thing that’s helped me a lot is writing down my achievements. To start with it was little more than ‘got dressed’ or ‘ate without feeling anxious’. More recently my accomplishments have been more substantial. Here I will document my bakes, writing, crafts, textiles, gardening and other bits and pieces. I’m getting over a chest infection so the start of ‘Me Made May’ passed me by. I’m jumping on the bandwagon a few days late. For those of you who don’t know MMMay is an annual endeavour in which sewers make an effort to wear and love their handmade clothes. I’m planning to wear at least one make every day. I’ll post my outfits here, though it’ll probably be a weekly thing as I’m far from organised. Today I felt fresh air for the first time in about a week. The cats were delighted to see me and my husband in the garden. That is one spoilt pussycat. My other cat came to play too but she’s a little camera shy. I have been ill for what seems like forever, with a mixture of asthma, an irritating head cold and perhaps the beginnings of a chest infection I’ve been feeling rotten for over a month. With my box of tissues and copious cold and flu meds, I donned my latest make and headed bravely to The Handmade Fair. I had an absolutely wonderful day with the ladies from Crafty Sew & So. Sarah and I did a little bit of watercolour painting in the morning. The tutor, Harriet de Winton, was fantastic. I’m so happy with my little floral wreath. Roses were super hard! The temptation to buy was overwhelming! I managed to reign it in and came home with two purchases. An adorable little unicorn necklace from Jazzy Menagerie and a foxy notebook from Miss Meaney’s. So much fun, now to sleep for a day or two. It was my nieces second birthday yesterday. She was a bundle of excitement. Each time a new person she knew came through the door she would give a bright surprised smile followed by a delighted squeal. Each present received with a careful and serious ooo (thank you). I ordered her a couple of books, though far too late to arrive on time. As it was I ended up whipping together a cute snuggly blanket the night before. 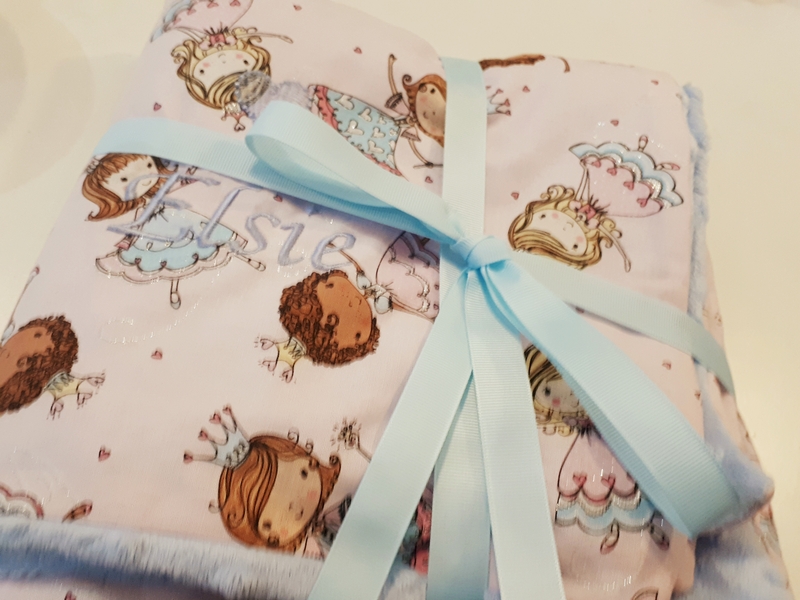 She’d had a visit to the shop (Crafty Sew and So) a couple of days ago and straight away lunged at a gorgeous sparkly princess fabric. I cut a rough metre square embroidered her name and backed it with a super soft dimple fleece. Because I didn’t have much time I placed the peices right sides together and speedily stitched them together instead of using bias binding. She was delighted and pointed to the princesses, as she’d done in the store. Instead of snuggling up with the blanket she decided it was far more fun to wave it around like a parachute. Everything is a toy when you are two. Sooooo…it’s been a little manic for the past, let’s say, month? Hospital trips, holidays, a severe asthma attack, and a hen weekend. You know it’s been a lot. However, in-between the madness, I have been pretty creative. I am super proud of this quilt I’ve been making for my little sister. It’s a little different to a normal quilt as it’s going to be weighted. My sister has autism and she really struggles with getting to sleep. However, like me, she will sleep like a baby with a few heavy blankets. The idea is to have it at 10% your body weight plus a couple of pounds. Craft Nectar has created an amazing tutorial with diagrams and clear instructions. 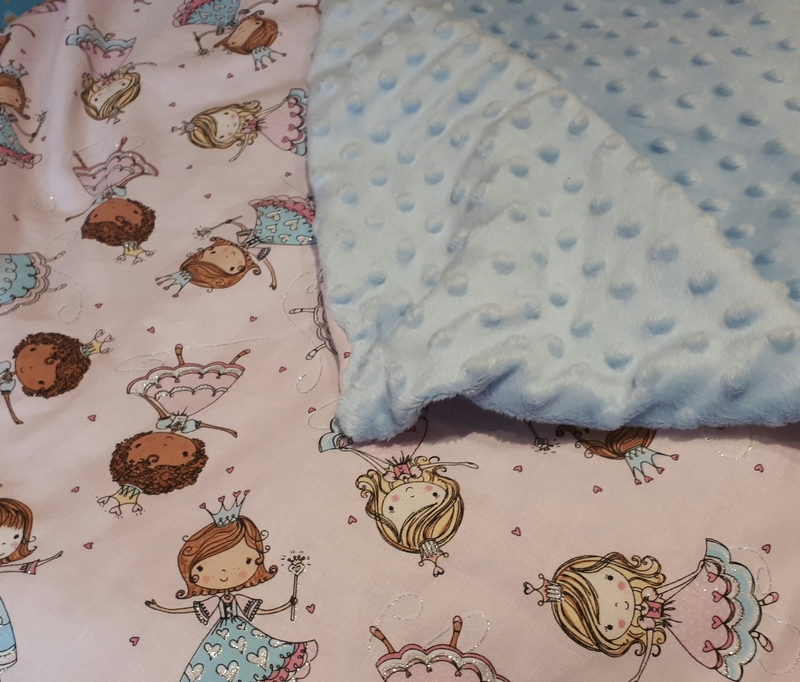 My Quilt is a little different as I used a patchwork top and wadding, most tutorials recommend a single sheet of fabric with fleece backing. So the Moneta party is coming up! If you’ve not heard about it, It’s an Instagram in which we make the Moneta dress by Colette. As happens with anything with any form of deadline or pressure (even if it’s imagined) I panicked and messed up. Previously I made a small version, it fit fine but I thought I could use a little more give around the waist. This time I tried the size up in a Cotton and Viscose Jersey blend. The fabric is gorgeous but unfortunately, I managed to stretch it out beyond any recognizable shape. After yelling at my sewing machine a few times and snapping several pieces of clear elastic, it was time to give up. Next time I’m going to just stick with the smaller size and use more stable fabric. Any further rescue attempts are not worth my sanity. This fetching fabric caught my eye at Crafty Sew & So, I’m somewhat smitten with it. Normally I go for more of muted tone but who can resist the allure of peacock feathers? It’s a Viscose Jersey, and shouldn’t stretch too easily. If I use the Sewing Cafe at Crafty Sew & So I can make my next Moneta on an overlocker should make things a lot simpler and quicker.